Jody Perrun, The Patriotic Consensus: Unity. Morale, and the Second World War in Winnipeg. Winnipeg: University of Manitoba Press, 2014. Pp. 292. Jody Perrun’s The Patriotic Consensus is a careful, nuanced, and effective contribution to the evolving scholarship on the history of the wartime home front in Canada. It aims to work beyond the well-established and well-known linguistic, class and ethnic divisions that polarized Canada through much of the twentieth century—even while it takes account of those divisions—to explore how the Second World War affected Canadian society. 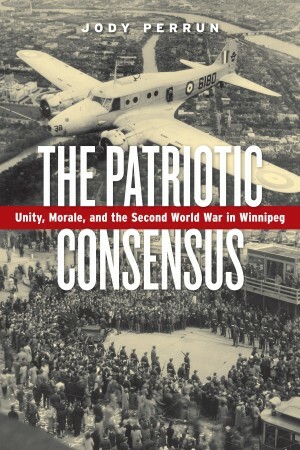 The Patriotic Consensus bills itself as a case study of Winnipeg during and in the immediate aftermath of the Second World War, but it is much more than this. In fact, one of the key implications of Perrun’s study is that exactly what counted as local and what counted as national (or, even transnational) experiences are difficult to differentiate. For a variety of reasons, the experiences of Winnipeggers were not precisely the same as those of other Canadians. But, neither were they dramatically different. Perrun concludes, appropriately in my view, that the Second World War both introduced fundamental changes to Winnipeg but was also marked by strong continuities. This is a full book. It has just under 220 pages of text that are completed by maps, tables, illustrations, extensive source notes and a bibliography. Perrun uses the idea of a “patriotic consensus” as a framing device, but his approach to this construct is appropriately measured. The idea of a patriotic consensus is simple enough: that Canadians should make a serious home front commitment to prosecution of the war effort to the greatest extent possible. Said differently, it is not just a love of country but a conception of how Canadians should relate to the state in times of war. As Perrun points out, in some instances, the “patriotic consensus” was no consensus at all. Instead, it was a discourse, ruthlessly mobilized against already marginalized groups and against the very ideals—freedom, democracy—for which Canadians claimed to be fighting. Nor, however, was the ideal of a consensus simply illusory. For a variety of reasons—including the threat posed by the Fascists—a very broad cross section of Canadians were able to “get behind” the war effort. This can be measured in terms of the seriousness with which large numbers of Canadians participated in volunteer services, purchased victory bonds, turned out for patriotic speeches, or accepted the necessary sacrifices of the war. Perrun does not make as much of this point as he could, because it stands largely beyond the framework of his study. But one might conjecture (as have Ian McKay and Jamie Swift) that taking the Second World War consensus seriously after the war meant changing the way the Canadian state operated, taking more seriously the commitment to the ideals of a democratic and fair society, and rethinking the international role of the military. What makes The Patriotic Consensus such a strong book is the author’s commitment to what I might call “good old fashioned historical research.” We live in a time of rapidly changing heuristics, many of which continue to explore the ways in which the unevenness and inequalities of Canadian society are maintained over time. Regardless of what it is called, this scholarship has a great deal to recommend it but, as Perrun illustrates, so too does sound and careful historical research. I really appreciate the fact that Perrun wrote this book to deepen our understanding of history, as opposed to revising it. He builds on a generation of critical scholarship in social history and adopts much of its mantel in organizing his work around a municipal case study. Notably absent from the book are the cuts and barbs that have defined discourse across competing historiographic camps. This is not a text build on quick one-liners, whatever those one-liners may look to say. To the contrary, it is built on broad research in primary sources (including important periodic discussions of their interpretive merits) that eschews reductionism. Distinctions of class, ideology, personality, perspective, ethnicity, gender, and language, among others, are examined carefully and with sympathy. Like any good social historian, Perrun does not lose sight of the real people who were caught up in the experiences of war on the home front, who lived and loved, worried about relatives and children, worked and cared for others, celebrated and suffered from guilt, fear, and what we now call post-traumatic stress disorder (PTSD). Perrun shows us not only how social-historical perspectives can advance the study of wartime Canada but also the continued relevancy of this approach to understanding the past. The other important contribution this book makes lies in how it details the increasingly blurred distinctions between the state and civil society as Canada moved through the Second World War. Because so much of the day-to-day work on the home front (say, with regard to promoting savings or bond purchases, recycling, providing entertainment for soldiers, providing support for economically distressed families, etc.) was done by volunteers, service groups, businesses, students, among others, exactly where the state ended and civil society began could be confusing to people at the time and today. For example, was the Canadian Patriotic Fund a charity or a branch of the state? Canadians held divided views on the subject. Perrun does not make this point, but this confusion fits well with another important storyline of Canadian history: the expansion of the state. It has long been recognized that the unusual circumstances of the Second World War required a fundamental reconsideration of the way in which the state—primarily federal, but also provincial and municipal—functioned. Perrun’s careful and detailed discussion of wartime savings and bonds (Chapter 3), service (Chapter 4), and social services and welfare (Chapter 5) illustrate how the state and civil society became increasingly and necessarily entangled if war aims were to be met. To be sure, there were limits to this entanglement. For instance, the federal government was woefully unwilling to intervene in housing markets precisely because it worried about the implications for the free market and capitalism. The result, as Perrun’s work shows, is that the state ignored reports of a housing crisis to the detriment of those people who lived in overcrowded and unhealthy conditions. But, the overall effect was to problematize in a constructive way distinctions about the limits of the state that had plagued Canada in the 1930s. A next step might be to pick up this line of analysis, as Perrun starts to do near the end of The Patriotic Consensus, and carry it forward more fully into the postwar expansion of the welfare state from the 1940s to the later 1960s. This might allow us to see how, and in what ways, the patriotic consensus of the wartime home front was remobilized, refined, and re-defined as the wartime men and women became parents of the next generation. It is tempting to draw lessons from the past for the present and, indeed, the idea that the past can serve as a useful guide to the present or the future is one of the standard rationales deployed for the study of history. I am not one hundred per cent certain how I feel about this perspective, but it is one to which many of my colleagues subscribe. If this were the case, the final lesson that we might take from Perrun’s text is this: beware of patriotism, even one that is widely shared. When patriotism is connected to the necessary urgency of military action, this warning becomes doubly important. In other words, one should not lose sight of the very democracy, freedom and security for which the country claims to both stand and be fighting. This may not be a particularly new message but the detailed and thorough nature of Perrun’s work amplifies the voice in which this warning is spoken. Patriotism is a dual-edged sword and those who speak most vocally need to recognize that they do not speak for everyone, nor should they assume that they have a right to speak in the name of the country. This is an important lesson for any time. The Patriotic Consensus is more than a fine book. The author’s care, thought-provoking narrative, and nuanced treatment of his subject make it a good book to add to one’s reading list. Ian Mckay and Jamie Swift, Warrior Nation: Rebranding Canada in an Age of Anxiety (Toronto: Between the Lines, 2012).